Day late and a dollar short, apologies. I was distracted yesterday by stories from Jes of people drowning in yachting accidents in 1922, being told I couldn’t use the word idiosyncratic in a write up because nobody would know what it meant, and the new developments in the Amy Bishop case which gets weirder by the day. Several years ago I ran across a Star Trek Cookbook filled with recipes for Spock’s Plomeek Soup and McCoy’s Baked Beans. I no longer remember the recipe for Plomeek Soup – although Star Trek and the internet being what they are I bet I could find one if I was really curious – but I do remember the recipe for McCoy’s Baked Beans. This is largely because it came with an incredibly sanctimonious note, assuring the reader that if they felt uncomfortable with using bourbon in the recipe they could easily leave it out. Now, given that it was ¼ cup of bourbon in a recipe that called for several pounds of dried beans and was going to cook for nine hours, and that these were McCoy’s Baked Beans and I think the man drank his way through most episodes this seemed to miss the point of being McCoy’s Baked Beans entirely. Now, to be fair, there are perfectly good reasons to leave alcohol out of a recipe – allergy or sensitivity to alcohol for example – but this cookbook was written long before that was something anyone was concerned about, and the note managed to convey the impression that adding that ¼ cup of bourbon would be a moral failing on your part. 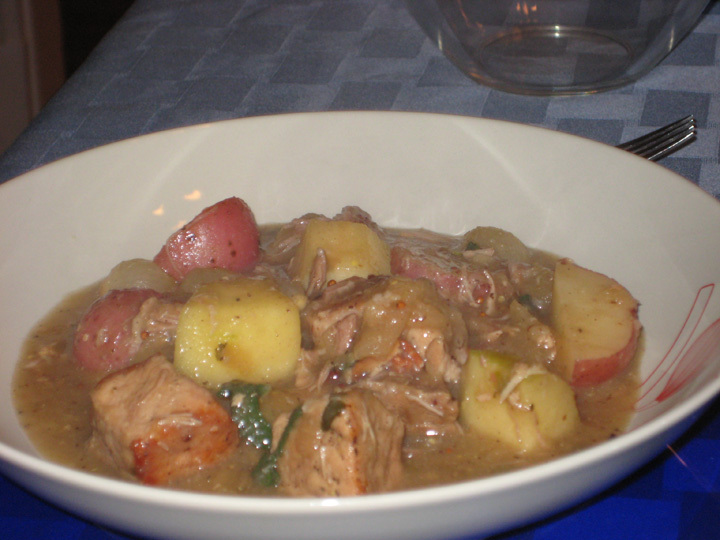 I had a somewhat similarly puzzled reaction to the recipe for Pork Stew with Hard Cider, Pearl Onions & Potatoes in the February Bon Appetit. There’s an odd little note at the bottom of the recipe saying that you can leave out the ½ cup of Calvados if you want to. The recipe also calls for 12 oz of hard cider, so clearly the issue isn’t about cooking with alcohol. It’s possible the editors of Bon Appetit are worried that you won’t be able to find Calvados, although I’ve never had much of a problem finding it, even in the wilds of suburban Massachusetts. However, given the ingredients that the editors of Bon Appetit routinely expect me to be able to find in my grocery store, I’m bemused that Calvados is on the other side of their personal Rubicon. Also, the ½ cup of Calvados was one of the reasons I was so excited by the recipe. As a side note, I actually wouldn’t recommend leaving out the Calvados entirely. If you can’t find it, I’d use a plain bourbon instead because it adds a nice layer of flavor to the stew. People who are allergic to alcohol should just give up on this recipe entirely. You could probably leave out the Calvados and use a mixture of apple juice and water in place of the cider, but it’s like trying to make this recipe kosher – an interesting intellectual exercise, but ultimately sort of pointless (chicken thighs instead of pork, chicken fat instead of butter, and no bacon – and really at that point it’s so far from the original recipe that it might be good, but it would also be entirely different). Most of the time I look at recipes on epicurious/Bon Appetit and I scale up to account for the fact that unbeknownst to me Dinner apparently spends its days conquering the Mongol empire and/or rustling cattle – this is the only way to account for how much food will disappear from the Dinner table. However, when I looked at this recipe I raised my eyebrows, because 3.5 lb of pork and 1.5 lb of potatoes and it only feeds six? Then I made it and I looked at it on Monday night and thought, that the editors of Bon Appetit were clearly delusional because my pot was full and I hadn’t even added the potatoes and apples yet I was going to have leftovers coming out of my ears. But, mea culpa they were right and I was wrong. I made 4.17 lb of meat (scaling the recipe up by a third) and served 8 people without a drop leftover. Of the myriad issues I have with Whole Foods not a single one of them has to do with their meat counter. I love the Whole Foods meat counter. It’s staffed by people who are unfailingly nice, and helpful and know their cuts of meat, and who will stand there on a busy Sunday afternoon and debate the merits of two cuts of meat with you, and explain the difference between cured and uncured bacon, and wrap up one sausage link and not look at you like you’re holding up the line or inconveniencing them in any way. Cook bacon in heavy large pot over medium heat until lightly browned. Using slotted spoon, transfer bacon to paper towels to drain. Sprinkle pork shoulder with coarse salt and pepper. Increase heat to medium-high. Working in 2 batches, add pork to same pot and cook until browned, about 7 minutes per batch. Using slotted spoon, transfer pork to large bowl. Reduce heat to medium; add shallots and parsnips. Cover pot and cook until beginning to soften, stirring occasionally, about 5 minutes. Stir in 3 teaspoons sage; stir 1 minute. Add ½ cup Calvados; cook until almost evaporated, about 3 minutes. Add broth, cider, reserved bacon, and pork with any accumulated juices. Bring to boil, scraping up any browned bits with wooden spoon. Reduce heat to medium-low; cover and simmer until pork is tender, about 1 hour 15 minutes. 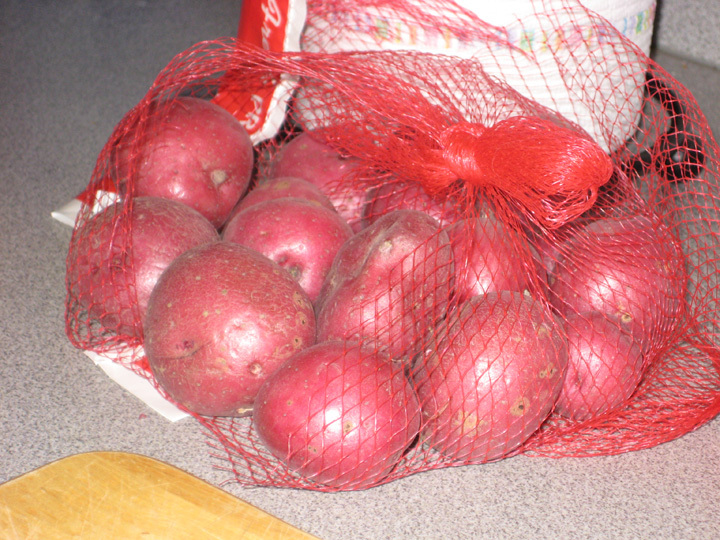 Add potatoes and pearl onions to stew; cover and cook until vegetables are almost tender, about 20-30 minutes. Add apples; cover and cook until potatoes are tender, 15-20 minutes. Stir butter and flour in small bowl to form paste; add to pot and stir to blend. Stir in mustard, 2 teaspoons sage, and 1 tablespoon Calvados, if using. Bring to boil; reduce heat to medium and simmer until thickened, stirring often, 2 to 3 minutes. Season to taste with salt and pepper. Stew can be made 1 day ahead. Cool slightly. Refrigerate uncovered until cold, then cover and keep chilled. Simmer stew over medium heat to rewarm before serving. The recipe said you could make it all a day in advance and then just reheat it. I thought the potatoes would just fall apart if you ended up cooking them for that long, so I made the stew up to the point where you add the potatoes & onions on Monday night (and then threw the frozen onions in, because I never think that pearl onions cook long enough in stews if you just add them at the end). Then on Wednesday night I skimmed the fat that had risen to the surface and set it on to warm, and when it had come to a simmer I added the potatoes and continued as directed. Ummm. Looks wonderful. The colour of the potatoes in the stew adds a lot to the visual appeal. My next dinner party.